At my dental office in Douglasville, we’re pros at getting and keeping our neighbors’ smiles healthy and beautiful. But what we want to make sure all of our patients know is that dental care for their pets is just as important. When you decide to start brushing your animal’s teeth, it’s important to choose the proper brush. There are canine-specific toothbrushes that you can buy, or a clean piece of gauze wrapped around a finger will work just fine. When it comes to the toothpaste, ask your vet what’s best. Never use human toothpaste on an animal as it could cause stomach problems. 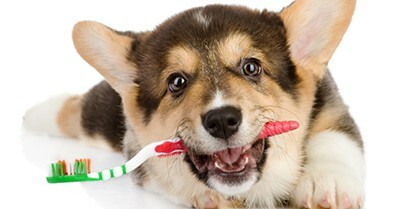 Brushing animals’ teeth is very similar to brushing your own. Make sure to hold the brush or your gauzed-wrapped finger at a 45 degree angle and gently rub in small circles. The cheek side of the teeth often accumulates the most tartar, so try to pay extra attention in that area. Brushing should occur two or three times a week. Just like humans, your pet’s diet can go a long way toward keeping teeth healthy. There’s specially formulated food your vet can recommend that will help control plaque and tartar formation. When it comes to snacks, avoid table scraps and choose healthy dog treats instead. Make sure to keep your pet’s smile in its best shape by following the tips above and visiting the vet regularly. To keep your smile healthy, maintain regular appointments at my Douglasville dental office and make sure to brush and floss daily. Accepting patients from Douglasville, Lithia Springs, Villa Rica, and surrounding areas. There’s nothing worse than tossing away a well-earned vacation day because you have a dental emergency. Good news! You can stop missing work due to your teeth! How? Let my Douglasville dental office show you. Oftentimes we avoid the dentist if we don’t have a problem. But that itself is a problem. Prevention is key! If we wait until we have signs of a dental issue, like pain, bleeding gums, or even a toothache, we’ve already waited too long. There’s a common myth that says you’d know it if you had a dental concern, but the truth is, that’s just not the case. Many dental problems have no warning signs. Cavities, for example, don’t hurt when they’re shallow, new, and haven’t reached the nerves. If caught early, treatment is simple. If left to advance, cavities can cause pain and could need more in-depth treatment. On a more serious note, oral cancer and gum disease may have little-to-no signs in the early stages. As they progress, however, they become extremely dangerous not only for your smile, but for your entire body. This is why we emphasize catching problems as early as possible. When detected in the first stages, both oral cancer and gum disease can be treated. Like anything else, if they’re not caught and are left alone, oral cancer becomes really serious and gum disease could lead to whole-health problems like heart disease, stroke, and even difficulty managing diabetes. Since it is so important to catch serious dental problems as soon as they appear, even if you can’t feel them, it makes keeping regularly scheduled appointments with your Douglasville dentist extremely important. We traditionally recommend appointments at least every six months, sometimes even sooner. It’s not only important to keep these appointments to keep your mouth healthy, they can help catch any lingering problems before they become serious issues. As always, appointments with us are important, but equally so is a healthy at-home routine. This means brushing at least twice a day and flossing at least once a day (yes, flossing is that important). If it’s been awhile since you’ve been to a dentist, or if you’re due for a visit, give my dental office in Douglasville a call. We’re always happy to see you and will work with you to get your smile healthy so you can get back to enjoying your deserved time off. Serving patients from Douglasville, Lithia Spring, Villa Rica, and neighboring areas. Just an awesome team of people.